Tracking is a non-competitive sport designed to utilize dogs’ exquisite ability to scent and discriminate between odors. In addition to the sport of tracking as promulgated by the American Kennel Club (AKC), Australian Shepherd Club of America (ASCA), and Canadian Kennel Club (CKC), as well as other organizations, tracking is used in search and rescue and law enforcement. There are other styles of tracking, including IPO (Internationale Prüfung-Ordnung, or “schutzhund”; often referred to as “footstep” tracking), but this article focuses on AKC tracking tests. There are four tracking titles available through the AKC. 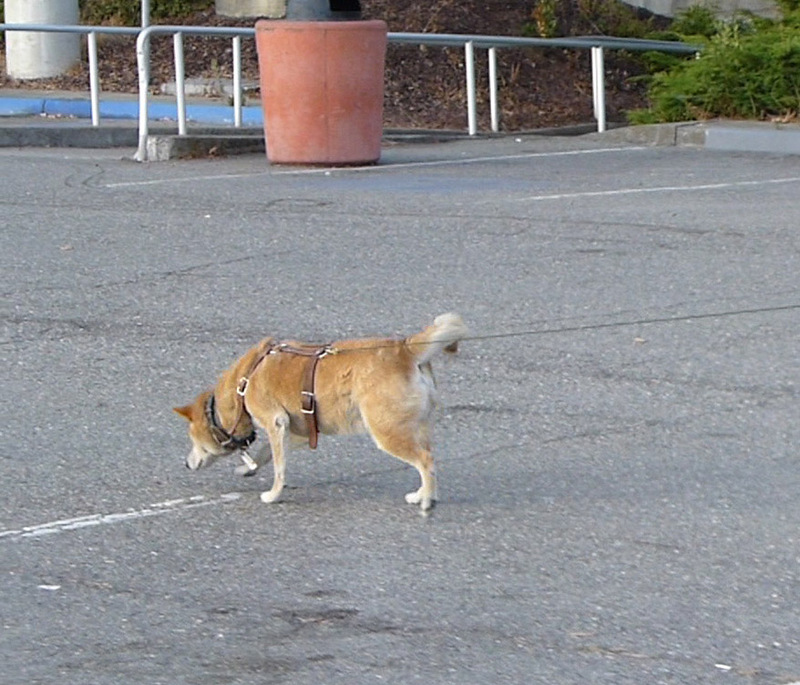 The Tracking Dog (TD) and Tracking Dog Urban (TDU) are the “entry” level tests. The more difficult tests are the Tracking Dog Excellent (TDX) and Variable Surface Tracking (VST) tests. Upon passing TD or TDU, TDX, and VST tests, the dog is awarded the title of Champion Tracker (CT). In tracking, dog and handler teams work together to follow a scent track and identify articles that a specific person (the “tracklayer”) has left for the dog to find. This article focuses on the sport as sanctioned by the AKC, although ASCA and CKC have similar tests and requirements. For more detailed descriptions of each type of track, see the regulations published by the relevant organization. Tracking is an outdoor activity and is often done in inclement weather, so handlers and dogs need to be happy working under such conditions. Dogs must be at least 6 months of age. Dogs must wear a non-restrictive harness with a 20–40 foot length leash (“line”). No food or toys are allowed on test tracks, although they are typically used in training. Tracking tests involve a two-day commitment for each of the two judges, tracklayers, the test secretary, and many others involved in the test. The judges spend the first day plotting the test tracks and instructing the tracklayers (and cross-track layers for TDX tests). The tests are usually held the following day, with the tracklayers walking their tracks and leaving their articles. The test starts after the tracks have sufficiently aged. Before entering their first tracking test (either a TD or TDU), dogs must pass a certification track. Certification tracks are laid by a judge or at the instruction of a judge and are equivalent to a tracking dog (TD) or tracking dog urban (TDU) test. Upon passing a certification test, the dog is given four certificates, which allows the dog to be entered into a maximum of four TD or TDU tests. One certificate must be submitted with each entry into a TD or TDU test. If the dog does not pass a TD or TDU test within 12 months of being certified or does not pass within four attempts, they must be re-certified before entering another TD or TDU test. The TD test is a field test, conducted on vegetated land. The test is intended to test the dog’s ability to follow a track laid by a tracklayer and find an article dropped by that person at the end of the track. TD tracks must be 440–500 yards in length, include 3 to 5 turns, and both left and right 90-degree angle turns must be used. The tracks are aged for 30 minutes to two hours before they are used. There is a cloth start article at the beginning of the track and a glove or wallet ending article at the end of the track. The dog and handler approach the start, which is marked by a flag and the test begins when the dog leaves this first flag. There is another flag located 30 yards from the start flag. This “directional” flag indicates the direction of the first leg of the track. No other flags or markings are present to assist the team. The handler and dog are judged based on their ability to follow the track and find the ending article. The TDU test is an urban test that involves hard surface (“non-vegetated”) and grass (“vegetated”) land. These tests are often conducted at schools, business parks, and other locations that have both vegetated and non-vegetated surfaces. As with the TD, this test is intended to test the dog’s ability to follow a track laid by a tracklayer and find an article dropped by that person at the end of the track. TDU tracks must be 400–500 yards in length and have a minimum of two different surfaces, include 3 to 5 turns, and both left and right 90-degree angle turns must be used. At least 10% but not more than 30% of the track must be on non-vegetated surfaces (e.g., paved sidewalks, lightly traveled roads, baseball diamonds, and parking lots). There are no turns allowed on non-vegetated surfaces. The tracks are aged for 30 minutes to two hours before they are used. There is a cloth start article at the beginning of the track and a glove or wallet ending article at the end of the track. The dog and handler approach the start, which is marked by a flag and the test begins when the dog leaves this first flag. There is another flag located 30 yards from the start flag. This “directional” flag indicates the direction of the first leg of the track. No other flags or markings are present to assist the team. 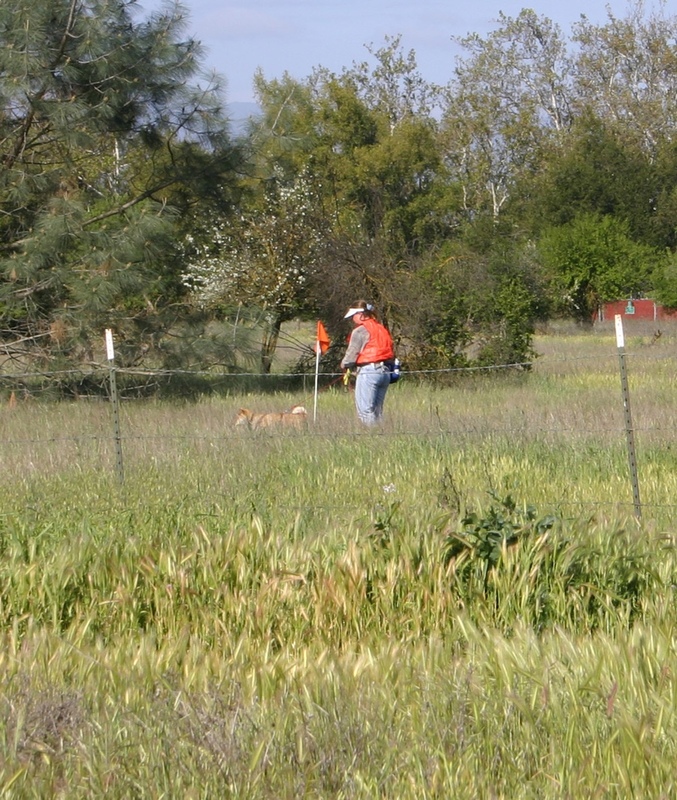 As in the TD test, the handler and dog are judged based on their ability to follow the track and find the ending article. This test is open to dogs who have earned their TD or TDU titles. It is a very difficult test, with tracks of 800–1000 yards in length that are aged for 3–5 hours. There are 5–7 turns on TDX tracks, with at least 3 being 90-degree turns, including both right and left 90-degree turns. There are also cross-tracks on two of the legs of the track, as well as at least two obstacles to challenge the teams. The cross-tracks are laid by two people who cross two legs of the track at the judges’ direction. Obstacles are intended to test the dog’s ability to adapt to changing scenting conditions, continue scenting while overcoming physical obstacles, and continue scenting under difficult and varied handling conditions. Streams, gullies, woods, fences, bridges, and lightly traveled roads are commonly used obstacles. As with TD and TDU tracks, there is a start article and an ending article. However, there are also two intermediate articles on the track that the dog must indicate. The last article may be a glove or wallet. There is a start flag at the beginning of the track, but there is no directional flag or any other indication of the direction of the track. As in the TD and TDU tests, the handler and dog are judged based on their ability to follow the track and find the ending article, but also on their ability to find the two intermediate articles and successfully negotiate the obstacles on the track. This test is open to dogs who have earned their TD or TDU titles. This is an extremely difficult test, with tracks of 600–800 yards in length that are aged for 3–5 hours. The track must have a minimum of three different surfaces, including vegetation, as well as two areas devoid of vegetation (e.g., concrete, asphalt, gravel, sand, hard pan, and mulch). At least one-third, but not more than two-thirds of the track must be on non-vegetated areas. There are no physical obstacles or obstructions on the track. There are 4–8 turns, at least 3 of which must be 90-degree turns. There is at least one “moment-of-truth” 90-degree turn that is in a non-vegetated area. This test is one of credibility, verifying the dog’s ability to recognize and follow the tracklayer’s scent, while adapting to changing scenting conditions, including scenting on non-vegetated surfaces. As with the TDX test, VST tests require the use of four articles (fabric, leather, plastic and metal), with the first article being fabric or leather. There is a start flag at the beginning of the track, but there is no directional flag or any other indication of the direction of the track. As in the TD and TDU tests, the handler and dog are judged based on their ability to follow the track and find the ending article, but also on their ability to find the two intermediate articles and successfully turn and track relatively long distances on non-vegetated surfaces. If you enjoy working with your dog outdoors, give tracking a try. It’s a lot of fun and the tracking community is very friendly and supportive.